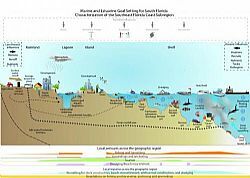 A Florida-based marine research team has developed a unique formal process and modeling framework to help manage South Florida's economically important coastal marine environments. The MARES project (Marine and Estuarine Goal Setting), led by the National Oceanic and Atmospheric Administration's (NOAA) Cooperative Institute for Marine and Atmospheric Studies (CIMAS) based at the University of Miami (UM) Rosenstiel School of Marine and Atmospheric Science, successfully integrated both ecosystem science and societal benefits into a marine ecosystem support tool to help improve decision-making by natural resource managers. The results of their findings have been incorporated into the revised Guidance Document for the National Marine Sanctuaries' Condition Reports and are being used by the Our Florida Reefs community working groups, the National Parks Service, NOAA's Integrated Ecosystem Assessment efforts, and in undergraduate courses at Florida universities and colleges.